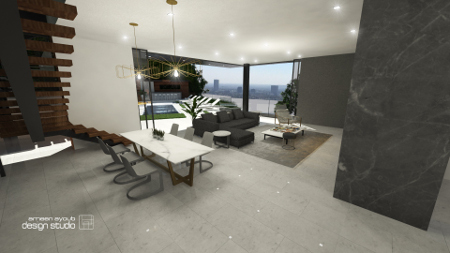 Ameen Ayoub Design Studio commissioned to renovate and create an additional elevation to stunning house on Belfast Drive near Suset Plaza. 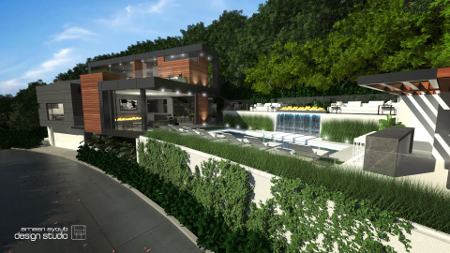 Ameen Ayoub Design Studio (http://www.ameenayoub.com) was commissioned to work on 1331 Belfast Drive near Sunset Plaza. The client wanted to remodel an existing 1950's multilevel home and add a master bedroom addition above the highest existing floor. 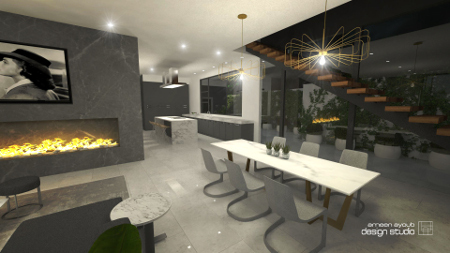 Since the client wanted to create a larger home and modernise the interior and exterior, we proposed to create more than just a stucco box home. 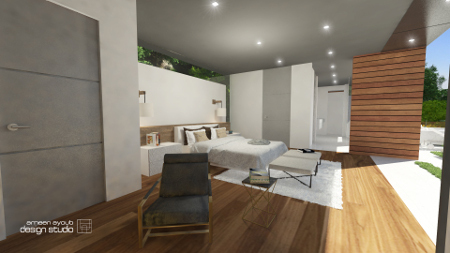 The ground street level only has a stucco-faced garage and above that, a two bedroom, two bath with a kitchen and living room that looks out to an existing pool and deck built into a hillside with great views of West Hollywood. The home had three distinct volumes and all three were faced with stucco. We would add a fourth volume above the existing home. We proposed a different material for each commissioned and new volumes. Additionally, we proposed metal trim along the upper new roof overhangs so that the appearance of a strong linear element would track along each overhang and connect down to the existing home. The effect was similar to a snaking form that tied the home together. Additional materials used included ipe wood siding and concrete fiber panels. I had just finished up a very large home where we used similar open facade elevation ideas with metal and ipe wood and we liked how it allowed the home to change materially while sticking to a minimal feel overall. The previous experience of building in the Los Angles hillside market allowed us to maximize the home's square footage without sacrificing design intent. We used similar design elements and planning methods from previous jobs but here, we reinvented and improved on almost everything. 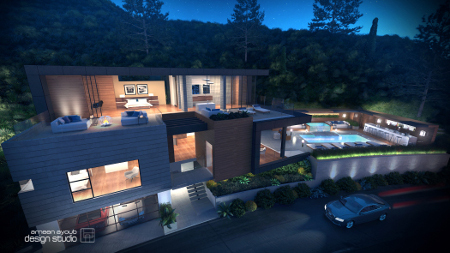 The home is 3,400 square feet and has a typical hillside garage at street level. Above the garage is the main living room and kitchen with two guest bedrooms and a powder bath. The living room flows out to an existing pool and deck area. The new master bedroom and master deck sit above both the garage and main floor. We engineered the main floor to accommodate one large open kitchen, dining, and living room with a grand floating steel staircase leading up to the master bedroom level. 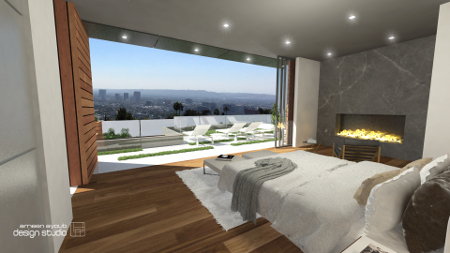 The master bedroom has a huge twenty-foot glass sliding wall that opens up to a 1,000 square foot deck with expansive views to West Hollywood. 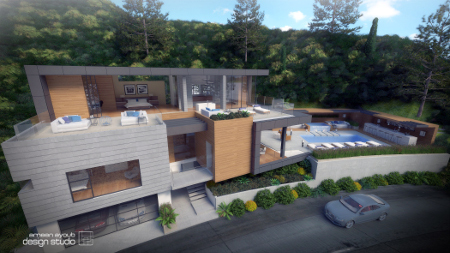 The existing home posed a few challenges in planning and construction in regards to the hillside behind the home. We needed to build a debris fence in the hillside which necessitated some fairly complex engineering. About six shallow caissons were placed along the hillside to protect the new home and addition. With this investment, the home is not only safer but has a newly graded hillside which will landscape out well. The black metal roof trim that snakes its way from master level to the main level below is undoubtedly the key design element that unifies the entire home. 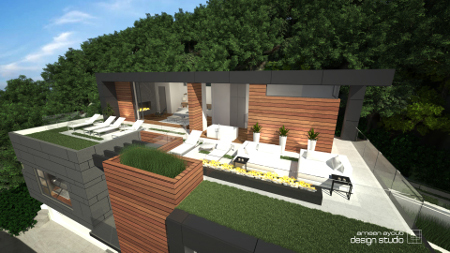 We are using some fantastic design strategies to accentuate a well-planned renovation and addition. We are utilizing sustainable materials and building in passive and active heating and cooling systems. Additionally, we are adding walls of glass and operable windows to bring air and light into the home. The net result makes for a smart and livable home that feels as if it was built not as a renovation and addition but rather from the ground-up with strategic and well thought out, executed design intention.